As the name implies, this is a TV that your littlest Sims can watch, and so can their parents and/or older sibs. They can’t do it indiscriminately, though; maybe I need to get with the times, but I think that an adult (or at least someone older) should decide what the tots get to watch and when. So, I’ve made it so that toddlers can’t turn the TV on, and they also can’t change the channel – an older Sim has to do it for them. They’ll continue to watch even if the older Sim wanders off, though (because in my mind, their parents/siblings wouldn’t do so without making sure the TV was turned to something kids-friendly first). And once someone has turned it on for them, their TV watching is just like older Sims’, so they’ll gain cooking skill if they’re watching the Yummy Channel, and they’ll also gain enthusiasm if you have FT. And they’ll react to what they’re watching, too, so expect them to whine or even cry if it’s something they don’t like, and to laugh if it’s something they do. They also might make their displeasure known if and when you turn the TV off on them. The Tube for Tots comes in two variations, a bigger one that goes on the floor, and a slightly smaller, short-legged one that can also sit on surfaces and dressers. You can of course have both in your game at once. 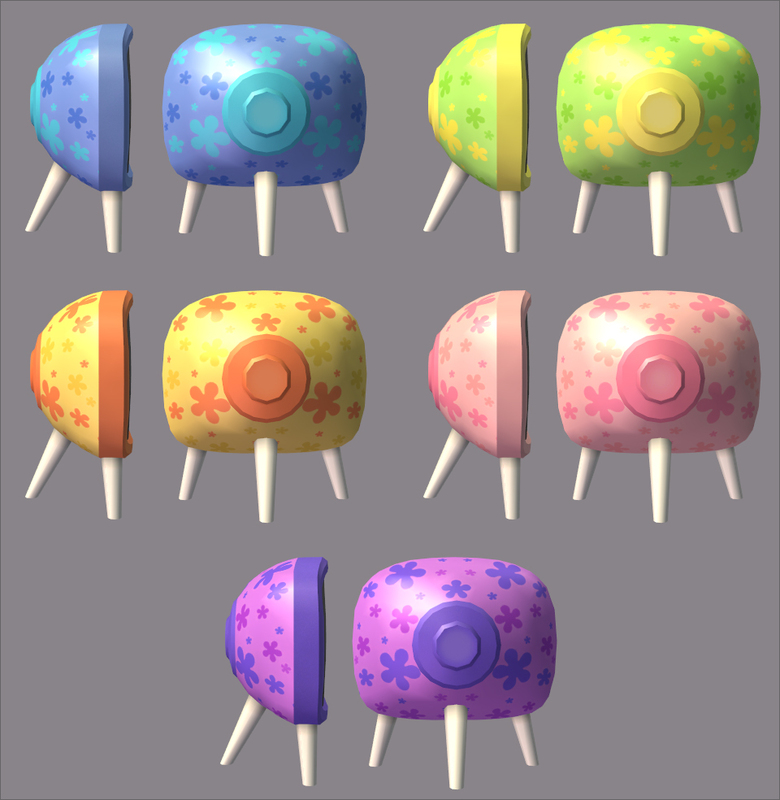 And there are recolours, too. It would be rather a boring toddler TV if it didn’t have recols, don’t you think? 😉 They are the same for both the bigger and the smaller TV; the only difference is that with the bigger one, the legs are a separate subset, whilst with the smaller one, they’re the same subset as the TV, mapped to the solid-coloured frame. Sometimes, the “Change To” menu option for adults and children will disappear, leaving only the options to turn the TV off and to work out. Most of the time (but not always), it will return if you have a Sim turn the TV off and then back on again, but sometimes it doesn’t. It will always return if you have a Sim work out to the TV for a little while, though, and also if you rebuy it. Despite my best efforts, I haven’t been able to determine what triggers it, but it won’t throw errors or cause jump bugs or anything like that (unfortunately for me – an error log, I can work with), so it’s perfectly benign, even if it might be a bit annoying. Just so you’re aware that it might happen, and know that I am, too. As I said above, the recolours are the same for both TVs. 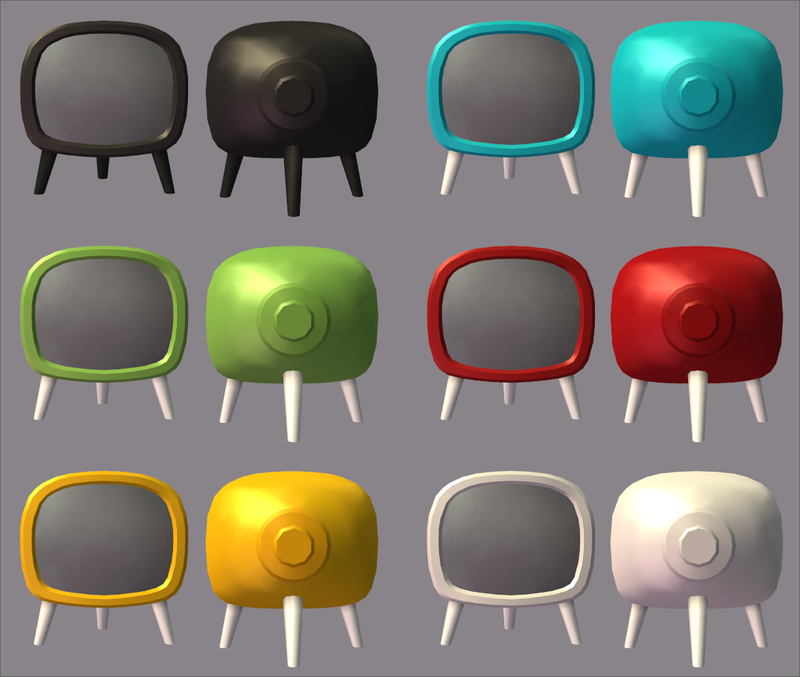 I’ve made two variations: one where the smaller TV is repositoried to the bigger one, and one where they stand alone and have their own, separate recols. The two variations have the same GUIDs, so you can only have one of them in game at a time. This entry was posted on 22 April, 2015 at 18:05	and is filed under BUY MODE, Children, DOWNLOADS, Electronics. You can follow any responses to this entry through the RSS 2.0 feed. You can skip to the end and leave a response. Pinging is currently not allowed. I don’t normally place more than one television in my Sims homes, and not every household even has one (tend to have them doing other things around the home or out and about the town), but I can’t pass this up. Nix, this is darling! Thank you for fulfilling the request by Kitten on a Cloud in such a sweet way. I love the colors and patterns. Kudos to Kitten for thinking of it and to you, Nix, for creating this tube for tots! Usually I am not very interested in toddler things.But… as I know how your creations are welldone ,I thought to give it a try. So I downloaded the short standalone and the white and black recolor. -only 104 kb for the whole thing,that is genious. -the tv itself is welldone,simple without useless decoration. -I have tested the tv in one of my spaceships ,it works perfectly. -Than I figured out how to make it work as a bedtv,as a tabletv without using the table and as a wallintegrated tv. Conclusion:This tv stays in my downloads,it is perfect. Have a big THANK YOU. PS: Just a question:Is it possible and allowed to add pics to the comments? I thought I had responded to this already, very sorry for that! I’m glad you decided to download it even though you don’t usually, and even happier you liked it so much you wanted to keep it. 😀 I do strive to make all my things the best that I can make them (so I’m very happy to hear you say you think my objects are well-made), but that doesn’t mean everything is everybody’s cup of tea. This is cool! How did I miss it before. Thanks. Now I wonder if the normal TVs can be made toddler watchable as well. And that depends on what you mean by “watchable.” To make it so that toddlers have the option to watch TV? Sure, that’s just a matter of checking a box in SimPE. But to make it so that they use proper toddler animations and reactions instead of the ones for adults (because the latter makes them float in the air, stiff as boards, speak in adult voices and generally look like possessed demon children)… that’s a whole different kettle of worms, that’s too complex to work as a global mod. Sorry. And I totally forgot to mention that the link for the toddler channel is deeeead. I hadn’t noticed that, so thank you very much for pointing it out! The channel seems to have disappeared from Affinity, so I’ve changed the link to point to the (same) one on MTS instead.